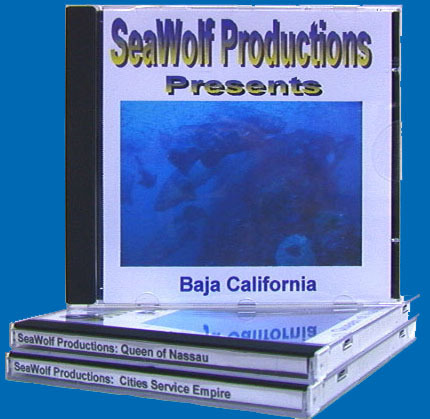 SeaWolf Productions CDROM disks are WMV / MPEG versions of the video tape presentations. Great for playing on laptop computers during liveaboard dive trips, these CDs include the same narration, music and "Dive Brief" format as the popular VHS tapes. SeaWolf Productions CDROM disks are now available in Windows Media (.wmv) file format of the video tape and MPEG presentations. This video format is "optimized" for use with Windows Media Player and provides video quality dramatically superior to that of what MPEG can provide. Video play back quality is nearly that of the original digital videography. Please specify desired format ( MPEG or WMV) with your order. Mac users Click Here for a WMV Player plugin. Test the plugin at SeaWolf Theater. Special Edition Video and DVD products contain more in depth coverage of the subject matter and are longer presentations. They contain rare, often previously unseen subject matter. Now you can watch SeaWolf Production videos using your DVD player. All international customers please Contact US for additional shipping charges. Copyright 2002 SeaWolf Productions. All Rights reserved. WARNING: Federal law provides severe civil and criminal penalties for the unauthorized reproduction, distribution or exhibition of copyrighted materials. Criminal copyright infringement is investigated by the FBI and may constitute a felony with a maximum penalty of up to five years and in prison and/or a $250,000.00 fine. Licensed for the private home exhibition only. Any public performance, copying or other use is strictly prohibited. All rights reserved.